Thought I'd share a recent experience with my E400 and its run-flat tires, which were both just some 5 months old. 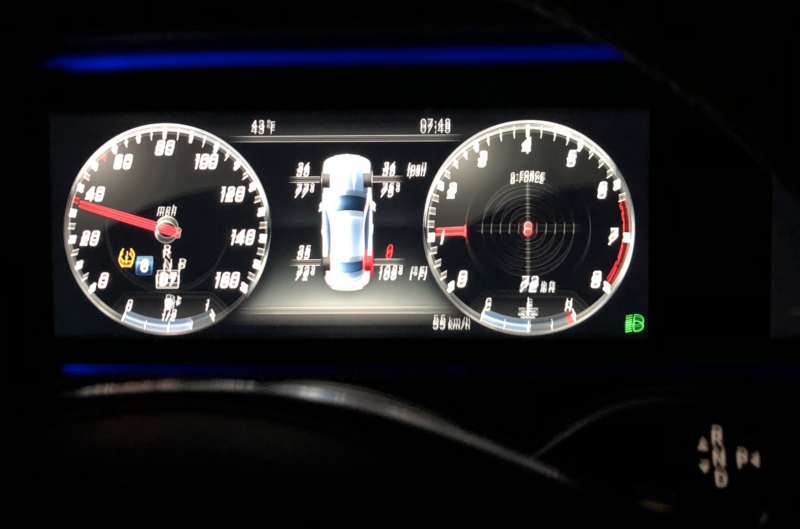 One hour into a longish highway trip, around 6 pm, the car voice-commanded me to drive to the side of the road and stop because of a tire failure, and I saw the tire pressure on the right-rear tire go from 35 psi to 0 in about 4 minutes. I took the closest exit and located the nearest NTB, which was only 2 miles away and ask them to patch or replace the tire. They told me run-flats cannot be patched, and furthermore, that they do not have tools to remove a run-flat tire from the wheel, so they could not do anything to help. I was also told the only place in town equipped to replace run-flats had closed at 6 pm. So, I asked them to fill the tire with air, and went to the closest AutoZone to try fix-a-flat to avoid driving the tire on zero pressure. The hole was too large for the fix-a-flat to have any effect, so after checking Goodyear's guidance on summer performance run-flats on the internet (good for about 100 miles at less than 50 mph), and realizing I was 70 miles from home, I limped back home on backroads at <50 mph, which took about 2 hours, so I got home around 9 pm. Google Maps was great in finding a reasonable way to get there by clicking "avoid highways", so I would not be the dangerous slow-driver impeding everyone's progress on the highways. I was also continuously checking the temperature of the flat tire, to make sure it would not disintegrate (see picture, sorry it's blurry). The next day I called an MB dealer and ordered 4 Michelin PILOT SPORT A/S 3+ tires in OEM sizes 245 front, 275 rear (I needed all-season tires for the upcoming snow, as I have no room to store winter tires). The tires were installed two days later and I was compensated for the damaged tire and installation thanks to the Wheels and Tires warranty I purchased, which was nice of the dealer to honor. It kind of sucked to see 3 perfectly good 5-month-old run-flat tires going to the trash, but I had thought of changing them anyway. I also bought a flat-tire repair kit including a pump that lives under the trunk floor. My goodness, what a horror story. Again, what's the sense of rf tires if you can't repair or replace them at auto shops along the highways? The idea of running so many miles with a flat tire, without damaging the expensive rim is even more heart pounding. The tire is one thing, but wrecking your rims? I'm still not quite sure how that works. Yes, when I was limping back home, I was worried about the zero-pressure run-flat tire eventually tearing itself apart and both damaging the rim and leaving me stranded on some backroad waiting for a tow-truck to carry away the car and me along with it. The run-flat tires have very stiff side walls and a patch of rubber around the rim that should prevent damage to the rims as long as the tire's structural integrity is preserved, so I assumed (out of possibly misguided intuition) that if I kept its temperature below 120 F, it should be fine. It only reached 113 F for about a minute and I drove a bit slower after that to bring it back to 110 F. It would have been harder in the summer but still, those two hours were pretty unnerving. Great info. Like you, I also replaced my RFTs with normal tires, although by choice rather than by necessity. I opted to try Pirelli P Zero All Season Plus tires, however. Also like you, I found the improvement remarkable. Pliability, deftness of handling and traction were noticeably improved while noise was made much quieter and comfort undeniably enhanced by the transition. Fix a flat and a portable compressor now reside in the trunk compartment. I'm undecided as to whether to sell the old tires with only under 1k miles on them or keep them for when I ever sell the car. Out of curiosity, I have 245s all the way around on my 450 4matic wagon. Is 275 the default on the rear of sedans? I have used RF tires for 16 years now and love them. They can be fixed (if the puncture is not in the sidewall or too large) or replaced by any large tire dealership. I originally used Goodyear, but switched to Michelin because they seem to run a little quieter and softer. The main reason for RF tires is that you do not have to stop along side the road and change a tire. A real plus for petite drivers, especially at night or along dangerous roads. The second best reason is the lack of need for a spare tire. The only necessary extra for using RF tires is that you have a working tire pressure monitor. You cannot tell if a RF is low on pressure by looking at it, and running it without proper pressure will cause a build up of heat that will eventually lead to failure. Question: I have read that once you use the foam you cannot patch or fix the tire you must replace it. Is this correct? If after you use the foam you cannot fix the puncture why not keep the RF, use the foam and then replace the tire? In other words once you use the foam, whether RF or normal tires, you must replace the tire so what is the advantage of replacing the RF with a normal tire - other than ride quality? JTK44 Ride quality, mpg, etc. Using the foam will usually ruin the tire pressure monitor inside the RF tire, so even if it patches the tire, you will have to dismount the tire and replace the tire pressure monitor in order to be safe. As for foam in regular tires, I have no experience. I have never used foam in a tire. Just did a google search for "fix-a-flat" foam. The consensus is that once used you have to replace both the TPS and the tire. It is not a permanent fix. The job of the foam is to get you to the auto store so the tire and TPS can be replaced - once you use the foam it fouls the TPS which along with the tire must be replaced. Here is the way I see it: You start off with RF included in your car: you replace those run flats with normal tires at a cost of least $1,000 ($250 per tire includes balancing). You have a flat, use the foam, go to the tire store and have both the tire and TPS replaced another $300 - tire, replace TPS and balancing. On the other hand, keep the RF and when you have a flat either drive to the auto store if it is within 100 miles or use the foam if it is longer and then have both the tire and TPS replaced $400- assuming RF cost $100 a tire more. That to me is a savings of $900! Of course the best solution is to have normal tires with a spare. Last edited by JTK44; 12-04-2018 at 09:31 AM. I'll be keeping my RFT's with my wheel and tire insurance for the next 5 years or 75,000 miles. I figure if I have a catastrophic blowout in the sidewall and wind up having to have the car towed to a MB dealer, it's covered, the tire replaced for free and if I have to pay for a hotel room for one night, it's far less than the cost of replacing the tires in the first place, by a HUGE margin. I will say, as much as I dislike rf tires, these Pirelli Cinturato P7 on my E450 CAB have been the smoothest and quietest rfs I've ever been forced to have on a car. I don't know if it's just inherent in the E450 class ( this is my first) suspension or what. I was going to replace them with traditional on delivery, but decided to try them out for a while to see how they hold up. I've read great things about the P7 plus regular tire as well...my first go round with Pirelli. Though the ratings between the two vary greatly among consumers on Tire Rack, with the P7 Plus generating much higher values. Last edited by rustybear3; 12-04-2018 at 09:50 AM. I will say, as much as I dislike rf tires, these Pirelli Cinturato P7 on my E450 CAB have been the smoothest and quietest rfs I've ever been forced to have on a car. I don't know if it's just inherent in the E450 class ( this is my first) suspension or what. I was going to replace them with traditional on delivery, but decided to try them out for a while to see how they hold up. I've read great things about the P7 plus regular tire as well...my first go round with Pirelli. Know very little about their reliability and tread wear. I have the same tires on my E450 and I had them on my C300. I was on the C300 and am on E450, very happy with them. Guys, unless you try them back to back, you cannot offer a comparison. You are simply saying it's good enough...without knowing what the "enough" really is. Having just done the switch, I can tell you "sound" of the RFTs doesn't even remotely compare to the "quiet" of normal tires. It's a bit eerie the first time you drive it after the former. But, I agree for most Benz drivers here on the forum: who is really going to repair/plug/change a tire? Most drivers are going to call AAA/Benz to come get them. And that includes the RFT crowd, especially those posting on MBWorld that have blown out a RFT sidewall. Curiously, no pictures of normal tires going that way. So, I don't really know if MB did it to save weight (probably) but in fact to offer a nice convenience to drivers that were never going to change a tire/spare on their own anyway. I think it was a good decision. Just like my decision to get rid of them (but I ain't the typical MB driver). I think it's great you're happier with the non-RFT's on your car. I'm sure there is a difference. It's just not important enough to how I drive to make that expenditure. And my experience with RFT's on the last few MB cars we've owned have been really good. Fingers crossed that continues. This is a mutually agreed upon point. RFTs are admittedly better and as I stated above, probably the much better choice for the vast majority of MB owners. Sadly, Rod rbrylaw , you'll never know how they perform in the cold. It's 30s here today and you're still lazily cruising around in the high 60s. Wait, are you wearing a sweater?! When did Mercedes on the E class switch from regular tires to run flats? If most Mercedes are on RF then most blowouts/leaks/sidewall problems will be with RF - as those are the tires that are on the cars. That may explain why no one is posting about problems with normal tires. Just my opinion: Most people are not going to spend over $1000 switching brand new RF tires just for a quieter ride and slightly improved handling. Also those of us who lease, and in the north east that represents over 70% of the E Class owners, are not going to go through the expense of switching from RF to normal tires when in three years the car is going back to the dealer. On my 2016 E 350 4matic I have Michelin regular tires with a spare. Fortunately have not any problems. Before this I had a BMW 540i xDrive with RF. The Mercedes ride was much quieter and smoother but that could be as much the suspension as the tires. Interesting that presently BMW offers as an option normal tires with a spare (not available several years ago) while Mercedes does not. Wish that Mercedes did offer the option of normal tires + spare. As I drive to Vermont, with the nearest Mercedes dealer two hours away, I would certainly have opted tor this option! I am getting my new E 450 4matic on December 27 and will report back as to quietness as compared to my 2016. Sadly????? No sadly in not having to experience cold temps! No Sir. No Way! LOL It's going to be about 74 today, but brrrrrrrrr, a cold front is coming through right now and tomorrow it will be a frigid 64. I'm wearing a very light weight long sleeve T-Shirt today. I live in Ohio, and as soon as the temps hit rare 50's we drive with the top down....with the Airscarf and seat warmers and vents, it feels like summer....I know, we're crazy! Figure a few more drives in December before I need to store for the winter. This Baby won't see rain or snow. A RF on a fully loaded car is rated for 19 miles, not the 50 miles for a lightly loaded car. On the road non-RF tires can be easily replaced whereas RF tires are very difficult to replace especially when traveling. In my metro area Tire Kingdom needed 5 days to obtain a Pirelli replacement. My local MB parts department keeps them in stock, but they keep very limited hours. Lose a tire on a Friday afternoon and you are sure out of luck until at least Monday. The best part of having non run flats was that a MB technician would come and change your spare tire for you on the spot! That is excellent service!!! I forget it this is part of the standard SOS or if it ran out after a trial period. Can't recall at the moment. Also, for those leasing your vehicle - when you return your lease, if the vehicle came with run-flats then you will have to bring them back with the run flats. To the OP, maybe you already mentioned that you had no place to store them, but would have been nice to sell the other 3 tires if you did have some where to place them? You forget that there is no spare tire. The MB road service is subcontracted especially if one is some distance from a MB service facility such as when traveling. When i had non run flats, my cars had spare tires... Is this what you mean? And that's absolutely a good way to go. In my case I was very frustrated that I had a commitment I could not miss the next day (so ended up having to rent a car after 9 pm and drive in the early hours of the morning to get there), and what could have been a simple patch on a non-rf tire became this whole mess of driving back 2 hours slower than 50 mph. If I had had time to spare, the hotel+tow option would have certainly worked. Additionally, I had to change the tires anyway, as summer performance tires are simply undriveable in any amount of snow. I learned that the first winter I had my Infiniti G35 Coupe 6MT with Expedias S-01 and got stuck in the airport parking because of 2 inches of snow, regardless of the clever limited-slip differential trying its best to get traction by rotating both rear tires. I replaced those with Michelin A/S tires, never had a problem again. So, in the end replacing the RF tires was the easiest path for my particular case, and so far it's working out pretty well, other than my wallet is about $1000 lighter because of the new tires.